The Hay Barn lit up for an evening wedding reception. 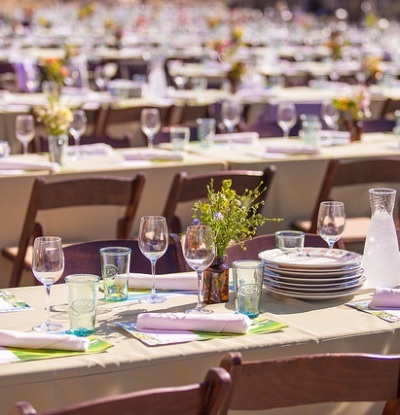 Tables set for the 50th Anniversary of the Farm & Garden celebration dinner at the Hay Barn. 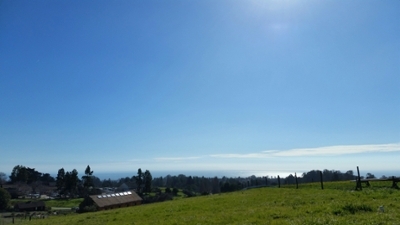 The Ocean View field on the 30-acre organic UCSC Farm, adjacent to the Hay Barn. The Cowell Ranch Hay Barn at UC Santa Cruz now has its own website, cowellhaybarn.ucsc.edu, with information on how to rent this popular, award-winning event space and the adjacent Ocean View Field. The heart of the Cowell Lime Works operation in the late 1880s and early 1900s, the Cowell Ranch Hay Barn has been completely rebuilt and now serves as headquarters of the Center for Agroecology & Sustainable Food Systems (CASFS) as well as a site for conferences, seminars, weddings, and other special events. 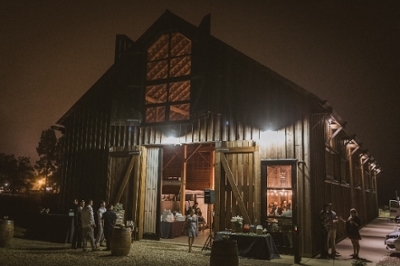 With demand for the Hay Barn’s use on the rise, site manager Heidi Harris has created a new website with event photos, rental details, and other event-planning resources. The site also provides access information for the adjacent Ocean View Field, located on the 30-acre UC Santa Cruz organic farm. The Hay Barn has received numerous prestigious design and engineering awards for its unique approach to reinventing this historic space for a wide variety of contemporary uses, while incorporating key period construction techniques. See the new Cowell Ranch Hay Barn website, read more about the project on the CASFS website, and follow the Hay Barn Facebook and Instagram sites.